Stephen S. Whitehead is in the Laboratory of Viral Diseases, National Institute of Allergy and Infectious Diseases, National Institutes of Health, Bethesda, Maryland 20892, USA. Theodore C. Pierson is in the Laboratory of Viral Diseases, National Institute of Allergy and Infectious Diseases, National Institutes of Health, Bethesda, Maryland 20892, USA. Zika virus (ZIKV) was discovered in Africa in 1947. Its impact on public health seemed restricted to sporadic local outbreaks associated with an illness characterized by mild fever1. But in 2013–14, ZIKV was introduced into the Americas, where it spread quickly. The large number of infections that occurred during the resulting epidemic revealed a previously unappreciated link between ZIKV infection of pregnant women and a devastating congenital neurodevelopmental disease in their babies2. The factors contributing to the rapid spread and disease severity observed in this outbreak remain elusive. Writing in Science, Rodriguez-Barraquer et al.3 provide a high-resolution view of the epidemiology of Zika disease in a Brazilian community during the 2015 epidemic. They also explore how prior infection with a related mosquito-borne virus contributes to the risk of ZIKV infection and disease. ZIKV belongs to a group of evolutionarily related flaviviruses that includes yellow fever virus and dengue virus (DENV). Flavivirus infection triggers the production of antibodies (also called immunoglobulins), some of which can neutralize the virus’s ability to infect cells. Antibodies can also coordinate other components of the host’s immune response that destroys virus-infected cells, even when they cannot inhibit virus infection directly. Some antibodies are specific for a single flavivirus type, whereas others react against several flavivirus species (this is called cross-reactivity). The extensive antibody cross-reactivity against flaviviruses has complicated the development of laboratory diagnostics to identify individual virus types4. Antibodies help to protect individuals against flavivirus infections. Nonetheless, in rare circumstances, antibodies elicited by DENV infection might exacerbate dengue disease in people infected for a second time with a different variety (serotype) of DENV5. DENV circulates in many of the same parts of the world as ZIKV, including South and Central America. The unexpected appearance of congenital disease following the introduction of ZIKV into the Americas raised the possibility that cross-reactive antibodies produced during a prior exposure to DENV worsen the severity of Zika through similar mechanisms to those that increase the severity of dengue after a second DENV infection6. Rodriguez-Barraquer et al. investigated the dynamics of a Zika outbreak in a DENV-endemic region of Brazil. The study focused on a community of people living in the city of Salvador who were taking part in a long-term study of DENV. Because molecular assays provide a limited window in which to diagnose infection, the authors opted to use serological assays to measure antibody levels at different time points. They measured the levels of antibodies against ZIKV in individual serum samples collected before, during and after the 2015 Zika epidemic to establish the prevalence of infection among the study population. Antibodies are grouped into five classes and several subclasses. The anti-ZIKV antibody response includes molecules that react against a protein called NS1, which is encoded by the virus but does not form part of the viral particle (virion). ZIKV NS1-reactive IgG3 antibodies are only transiently present in serum, partly because they have a short half-life in vivo7,8. Therefore, the presence of these antibodies in serum has been suggested to be a signal of a recent ZIKV infection7. Rodriguez-Barraquer and colleagues observed that most of the serum samples collected before ZIKV was introduced into the studied population did not contain ZIKV NS1-reactive IgG3 antibodies. However, most samples contained these antibodies within five months of the first report of Zika in Salvador. The authors estimate that 73% of the community was infected with ZIKV by October 2015. This proportion is similar to other estimates of ZIKV prevalence in Salvador9. Such a high level of anti-ZIKV immunity should protect this population from another epidemic ZIKV spread for many years. To investigate whether prior exposure to DENV contributed to the risk of ZIKV infection in the community studied, the authors calculated the incidence of DENV infection using serum samples collected before the introduction of ZIKV in 2015. They used a logistic regression statistical approach to establish the probability of ZIKV infection as a function of the quantity of IgG antibodies that react against the NS1 protein of DENV, which they determined using two serological assays. Curiously, two patterns were observed. The concentration of total DENV NS1-reactive IgG antibodies (irrespective of their subclass) was inversely correlated with the probability of ZIKV infection (Fig. 1). This observation suggests that DENV immunity has a protective effect against subsequent ZIKV infection. It also agrees with findings from a recent study of a population in Nicaragua10, and might explain the low incidence of Zika that is observed in areas of southeast Asia where DENV is endemic and highly prevalent. However, when the authors examined the subset of DENV NS1-reactive molecules of the IgG3 subclass, they observed that the concentration of these antibodies correlated positively with the frequency of ZIKV infection. These findings suggest that a recent exposure to DENV transiently increases the susceptibility of an individual to ZIKV infection. Figure 1 | Effect of dengue immunity on Zika virus infection. Rodriguez-Barraquer et al.3 measured the levels of antibodies (antibody titres) against Zika virus (ZIKV) and dengue virus (DENV) in individual serum samples from people in the Brazilian city of Salvador. They estimated the probability of ZIKV infection during the 2015 Zika outbreak on the basis of levels of total IgG antibodies against the DENV NS1 protein in samples collected in March 2015, before the outbreak (left-hand graph). The authors observed that the probability of ZIKV infection decreased with increased levels of anti-DENV IgG antibodies, which suggests that DENV exposure has a protective effect against future ZIKV infection. 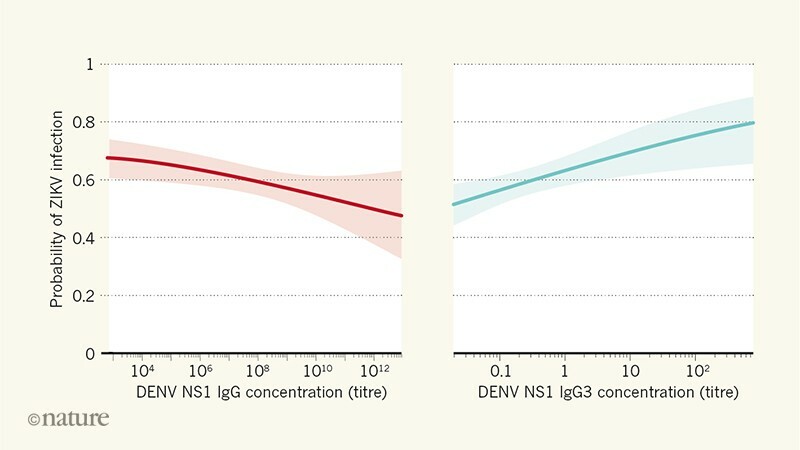 However, they also observed a correlation between increased levels of the IgG3 subset of antibodies against the DENV NS1 protein, which are thought to be a sign of recent DENV infection, and an increased risk of ZIKV infection (right-hand graph). Antibody titres are shown in a logarithmic scale, and pale red and blue areas denote 95% confidence intervals. Whether DENV NS1-reactive IgG3 antibodies have a direct role in the molecular mechanisms that increase the risk of ZIKV infection remains unknown. The NS1 protein is not part of the virus particle and also is not targeted by neutralizing antibodies. Therefore, NS1-reactive antibodies do not block virus infection directly, although they might contribute to limiting virus spread following infection. It is not clear whether DENV NS1-reactive IgG3 antibodies react against ZIKV. The biological basis for the transient nature of the IgG3 response to flaviviruses is not fully understood. If IgG3 antibodies are indeed a marker of recent DENV exposure, it will be relevant to explore how changes in the repertoire or functional properties of cross-reactive antibodies in the months following DENV infection contribute to vulnerability to, or protection from, subsequent infection by ZIKV. Such studies might identify relationships between antibody binding sites on the virion and antibody function. These functional correlates could then be investigated further in animal models of infection, or used to identify a protective immune signature that could be monitored in trials of candidate vaccines. Despite great strides in the understanding of the specificities and functions of human antibodies produced in response to flavivirus infections, much remains to be discovered about how they act together to protect against infection or occasionally worsen disease11. The analysis of well-characterized study populations in areas where these diseases are endemic, using innovative serological methods, holds great promise for identifying elements of the immune response and mechanisms of disease that will guide the development of countermeasures3,5,10. These same resources will be key for evaluating the impact of ZIKV immunity on subsequent DENV infections. Pierson, T. C. & Diamond, M. S. Nature 560, 573–581 (2018). Rasmussen, S. A., Jamieson, D. J., Honein, M. A. & Petersen, L. R. N. Engl. J. Med. 374, 1981–1987 (2016). Rodriguez-Barraquer, I. et al. Science 363, 607–610 (2019). Speer, S. D. & Pierson, T. C. Science 353, 750–751 (2016). Katzelnick, L. C. et al. Science 358, 929–932 (2017). Sariol, C. A., Nogueira, M. L. & Vasilakis, N. Trends Microbiol. 26, 186–190 (2018). Nascimento, E. J. M. et al. J. Virol. Methods 257, 62–68 (2018). Stapleton, N. M. et al. Nature Commun. 2, 599 (2011). Netto, E. M. et al. MBio 8, e01390–17 (2017). Gordon, A. et al. PLoS Med. 16, e1002726 (2019). Culshaw, A., Mongkolsapaya, J. & Screaton, G. R. Curr. Opin. Immunol. 48, 1–6 (2017).